I was surprised to learn that the CIA has had a long though not always fruitful relationship with the animal kingdom. In Spycraft, the authors describe many clever animal-assisted devices, from the dead-rat dead-drop pouch to the "acoustic kitty," a cat with a remote listening system embedded in its body. And what's this about the 1 million bats the CIA's precursor, the OSS, were gonna use to firebomb Tokyo during WWII? 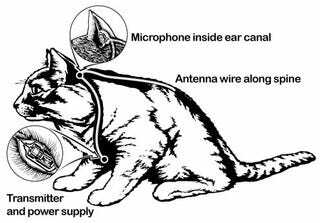 The acoustic kitty was a bionic feline with a 3/4-inch radio transmitter embedded at the base of its skull. The transmitter's antenna was woven in to the cat's fur, while the microphone was placed in the cat's ear canal. Yes, PeTA members, the cat project did consider "questions of humane treatment." Once the system was up and running, the cats didn't seem to mind it at all. Boom, total success right? Well, no. Spycraft author Bob Wallace told me in an interview: "The cat wanted to do what the cat wanted to do, and not what we wanted it to do." The British secret service actually used mice in a similar fashion, not as live microphones, but as a means to drag wire along the studs inside walls. The CIA trained pigeons to fly to laser dots and drop payloads, generally wireless mics. Obviously dogs too were trained for ops—though the Soviets were up on dog training, too, according to Spycraft co-author Keith Melton: the KGB trained dogs to sniff out the glue used by the CIA in equipment drops. Says Melton re: animals in the line of duty: "If you have a choice between putting human and animals at risk—and I'm an animal lover—you have to use an animal." Dead animals worked as well or better. Deceased rats, which apparently had lived long happy lives and died of natural causes, were hollowed out and used to stash secret information for drops in hostile territory. The reasoning was that people don't go around picking up dead rats to see what's inside. As for animals who might be looking for a tasty snack, the rats were painted with Tabasco sauce, repellent to every critter but humans. Fun fact: The CIA used white rats for this, so that they could dye them to match the indigenous coloration of local rats.